The feature-length first episode of Sky’s new big-budget, ‘Arctic noir’ drama opens with a shocking event, set against a bleak, sweeping, white vista, and it quickly spirals into a snow storm of violence, infidelity and intrigue. 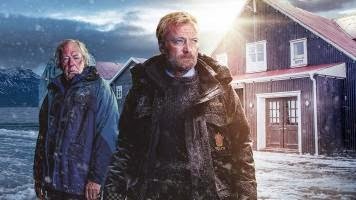 At the heart of it all are Fortitude’s own sheriff, Dan Anderssen (Richard Dormer), and the Met’s DCI Morton (Stanley Tucci), an outsider looking for answers and finding instead a rather frosty reception. Fortitude, the eponymous frozen town, is an isolated idyll with around seven hundred inhabitants. Billed as ‘the safest place on Earth’ by Governor, Hildur Odegard (The Killing’s Sofie Grabol), it soon becomes apparent that there are murky secrets and seeds of corruption lying just beneath the ice, waiting to be exposed by the summer thaw and there are worse things threatening the community than the polar bears stalking the outskirts or the sub-zero temperatures. The name Fortitude refers to the harsh weather, relative solitude and the long darkness of winter, which make life in the Arctic Circle so arduous, but also to the personal struggles affecting each of the inhabitants, none of whom may be entirely what they seem. It may also refer to the fact that it’s not an easy watch. Stark and fairly explicit in places, Fortitude is as unforgiving as the tundra, wrong-footing the viewer at every turn. There is something both unsettling and claustrophobic about the atmosphere and, even in terms of genre, Fortitude doesn’t play by the rules. The stylistic coolness and slightly surreal details put me in mind of Twin Peaks but Fortitude also has touches of Northern Exposure’s humour and even nods to the supernatural which recall shows like Lost. But maybe that’s just the polar bears. Created and written by Simon Donald, Fortitude was initially pitched as a movie. Certainly the £25m budget for the season premiere and the fantastic ensemble cast speak to a cinematic vision, more in line with Sky’s jewel in the crown acquisition, Game of Thrones. It looks absolutely beautiful, muted tones amplifying the magnificence of the aurora when we are treated to a lingering shot of the sky. The plotting, however, is much more labyrinthine and meandering than a film would allow, with so many dizzying twists and turns in the first ninety minutes alone that it’s hard to follow what exactly is going on. Each time you think you have a point worked out, something happens to pull the proverbial rug out from under your snow shoes. Whilst filming in Iceland, the cast were given their scripts on a need to know basis, ensuring they brought the element of surprise to their performances. It’s impossible to go into any detail about the story without spoilers flying about like snowballs, suffice to say that the event which rocks the town is a murder. But even the manner of the victim’s death is not straightforward. While the killing is initially thought to be a bear attack, as we follow various key inhabitants of the town – Michael Gambon’s dying photographer, Christopher Ecclestone’s research scientist, Luke Treadaway’s apex predator expert, Nicholas Pinnock’s ex-military man and his long-suffering wife (Jessica Raine) – it becomes clear that there are numerous motives in the offing and that everyone is a potential suspect. At one point, junior scientist Vincent Rattrey (the wonderful Treadaway, whose equally talented twin brother Harry can also be seen on Sky Atlantic as Victor Frankenstein in Penny Dreadful) asks a new colleague whether Anderssen is a good sheriff, to which she replies there is no way of knowing because he’s never had to deal with a serious crime before. This is pivotal. Just as we can’t know if Dan is a good or bad cop in a vacuum, we can’t know whether he (or anyone else) is a good person until the illusion of their perfect society is shattered and they are forced into action. 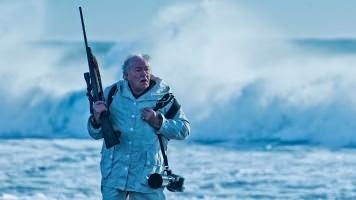 Stylish, compelling and self-consciously odd, Fortitude’s opener throws up myriad questions and promises the viewer an epic journey through a shifting and slippery landscape. The performances are commanding, the characters intriguing and the sense of small town paranoia is palpable. I love the imagery, symbolism and the ambiguity which hangs in the air like fogged breath. My only reservation is that, with storytelling this layered and complex, it’s easy to wander off and get waylaid or lost entirely. Here’s hoping Donald proves to be a sure-footed guide and that we don’t end up in the wilderness with snow blindness.